This paper examines the development of imperial Ottoman identity at the end of Ottoman rule in Salonica. This identity transcended communal divisions and antagonized separatist nationalisms fostered by neighboring Balkan states. It is argued that this identity was promoted by the Young Turk Revolution of 1908, at least rhetorically, and more importantly, by the cosmopolitan setting of Ottoman port cities. As imperial Ottoman identity was developed within Salonica’s pre/proto-nationalist and multicommunalframework, this paper focuses on loci conducive to an imperial Ottoman imaginary, such as newspapers, urban landscape, civic festivities and events, and schools. Newspapers promoted imagination of a common Ottoman community, articulated Ottomanness, and depicted Salonica as a shared city. The conviviality of Salonica’s communities was experienced in entertainment sites and public places, while Salonicans experienced a magnificent multiplicity of architectural styles and encountered the diversity of religions, languages, and cultures in their daily life. Political events, such as the Young Turk Revolution, and civic festivities, such as the visit of Sultan Mehmed V, mobilized Salonicans across communal boundaries. High-quality and foreign schools had become loci of embryonic Ottoman cross-national elites. In tandem with the development of imperial Ottoman identity, Balkan nationalisms were competing for the minds and souls of Salonicans with their antagonism culminating in the Balkan Wars and the demise of Ottoman rule and identity. The multicultural physiognomy of Ottoman Salonica has become a point of reference. Its contrast with the negative attitude shown by some of the local “homogenous” population toward foreign immigrants today has urged me to investigate the daily opportunities for social mixing enjoyed by the ethnic communities of Ottoman Salonica. I examine some of their meeting places and how these Ottoman institutions functioned so that members of separate religious communities often defined themselves through the common urban identity of their multicultural milieu. The “Ma’aminim,” known derogatorily as “Dönme,” followed in the footsteps of their messiah—Sabbatai Tsevi—and broke out of the boundaries of Jewish society by converting to Islam during the 1680s. They established their center in Ottoman Salonika. While outwardly being fully Muslim, the Ma’aminim secretly developed and observed a hybrid messianic religion consisting of ritual practices and beliefs that were a combination of their unique Sabbatian faith, their Sephardi Jewish origins, and elements appropriated from their non-Jewish Ottoman surroundings. The aim of this paper is to illuminate the songs of the Ma’aminim—perhaps the most crucial inner-communal source available to us—in light of the context in which they were created. The main tool for contextualizing will be the examination of two popular, previously unnoticed Ottoman poetic genres to which many of the Ma’aminim songs belong: şarkıand türkü. The paper claims that the extensive use of these genres reflects common cultural preferences among the Ma’aminim and wider cultural trends of the time in which the songs were created, trends that were related to changes in urban Ottoman society. This focus on these genres will demonstrate the importance of considering the Sabbatian mystical sources as a historical document and will offer a cross-cultural perspective for pursuing further research on these unique texts. Derided by Jewish assimilationists, Greek Christian nationalists, and subsequent historians as un-patriotic, Zionism in interwar Salonica in fact followed a broader pan-European trend and developed a symbiotic relationship with Greek nationalism. This article refines the emerging historiographical orthodoxy on European Zionism as a complementary nationality by approaching Salonican Zionism as a modern urban identity that renewed the local Jews’ ties to their hometown. The article focuses on the multifaceted relation Salonica’s Zionist youth associations developed with the public space of a rapidly Hellenizing city during the interwar years. Drawing on the local Christian and Jewish daily press, as well as numerous Ladino Zionist publications, it shows that Zionist associational practices and discourses produced a local identity that was at once Salonican and Greco-Jewish. The multifaceted sociability of the Maccabi Sports Club rendered Jewish youth visible in the public sphere and turned the young Maccabeans into the main symbol of Jewish presence in Salonica. Concurrently, the key role of the club in the local sports scene facilitated Jewish integration into a Hellenizing Salonica. Zionism was a primarily urban phenomenon, a diasporic but not deterritorialized national movement with multiple spatial references, as much to the land of “exile” as to the imagined homeland of Eretz Yisrael. This article explores the articulation of class, ethnicity, and cultural orientation in the popular music taste cultures of Salonican Jews in two different ethno-class contexts—interwar Salonica and post-statehood Israel—in which theynegotiated their identities in national cultures then being formed. In interwar Salonica the imperative of Hellenization and the increasing presence of Western popular styles came together in shaping a youthful middle-brow/middle-class taste group that favored Western-style music. At the same time, the proletarization of large portions of the Jewish community and the arrival en masse of refugees from Asia Minor reinvigorated a (predominantly) working-class taste culture, wherein late Ottoman styles and their Greek-language successors were still preferred. These divergent tastes persisted in many ways among those who immigrated to Palestine/Israel and were absorbed and “translated” into the Israeli ethno-class system organized around the discursive binary of Ashkenazim vs. Mizrahim. That the category of “Mizrahim” was from the outset overdetermined by ethnicity, class, and geography meant that working-class Salonican Jews and their descendants, unlike the well-to-do, were subject to both symbolic and real “Mizrahization.”The character of the working-class “Greek” Jew from the 1972 film Salomonico represents a culmination of this process of Mizrahization, wherein the working-class Salonican immigrants were installed in a ready-made cinematic blueprint for depicting ethno-class tensions between Ashkenazim and Mizrahim, using Greek music as a suggestive symbol. In tracing the formation, negotiation, and representation of these taste cultures (both real and imagined) across two national contexts, I seek to highlight that continuities are the result not just of a sense of tradition or stable transmission but rather of similarities between the national projects of the Greek and Jewish states, and the Sephardi Jews’ precarious position within them. This paper demonstrates how Jewish engagement with Arabic literature in Palestine/Israel provided an impetus for the Jewish cultural renaissance. By analyzing Yosef Yoel Rivlin’s Hebrew rendering of One Thousand and One Nights, it showcases how Arabic literature serviced Jewish nationalistic objectives by introducing the Arab other to a Jewish audience as the neighbor other and by enhancing a sense of attachment and belonging to the Oriental cultural world. Rivlin’s rendering of One Thousand and One Nights served as a prism through which his audience would view major issues that preoccupied the proponents of the emergent Jewish culture in Palestine/Israel. To reveal the nationalistic dimensions in Rivlin’s engagement with the Nights, this paper will approach the work as a window on discussion of the Jewish renaissance and return to the Orient, the Jewish self-conceptualization, the boundaries between the self and the other, the reconstruction of the Jewish past, and the enhancement of the modern Hebrew language and its literature. One of the repercussions of the Syrian civil war is that Turkey has become host to the largest number of refugees in the world. While initially Turkish perceptions were that the refugees would return to Syria after the end of the conflict, there is a growing recognition that at least half of them will remain in Turkey. This acknowledgment has required Turkey to rethink its policies toward its Syrian “guests.” The thorniest issues have been the question of granting work permits and citizenship to some of the refugees. The claim put forward in this article is that the attention these issues gained in 2016 can partly be explained by the Turkey-EU refugee deal, which suggests that despite the criticism against it, it has also had a positive effect in promoting the integration of Syrian refugees into Turkey. The migration crisis in Europe that coincided with a wave of terrorist attacks attributed to ISIS has exacerbated the dilemma between the desire of states to secure their territory and the European tradition of open borders and inclusion. European states have redefined both their migration policies and security measures in a climate of crisis and emergency that does not accurately reflect either the issues that have contributed to the current instability or the long-term nature of the terrorist threat. Instead, a systematic conflation is created between terrorism and migration by a number of states in the Mediterranean region. The aim here is to identify this conflation and show how it is manifested in the juxtaposition of exclusion and crisis narratives and the adoption of legal measures that overlap both security and migration. The article introduces preliminary findings on the topic and forms the basis for further research that might provide answers for states and for the EU as an organization that will address security agendas and migration policies within the framework of the European human rights tradition. Focusing on counterterrorism and migration measures and using policies and official statements by government officials, the article examines the links and influences between them. dock-ument aims to promote the theoretical discourse on topics related to various aspects of the Levant and the concept of the Levant, with preference given to personal essays and to lyrical prose. Its purpose is to encourage various perspectives and unique voices so they can be heard in a way that is not confined by the constraints of scientific discussion. The name, dockument, seeks to express the connection between text and context, between the pier, the home dock, and the ship of thoughts and reflections that will sail, we hope, to various interesting places. 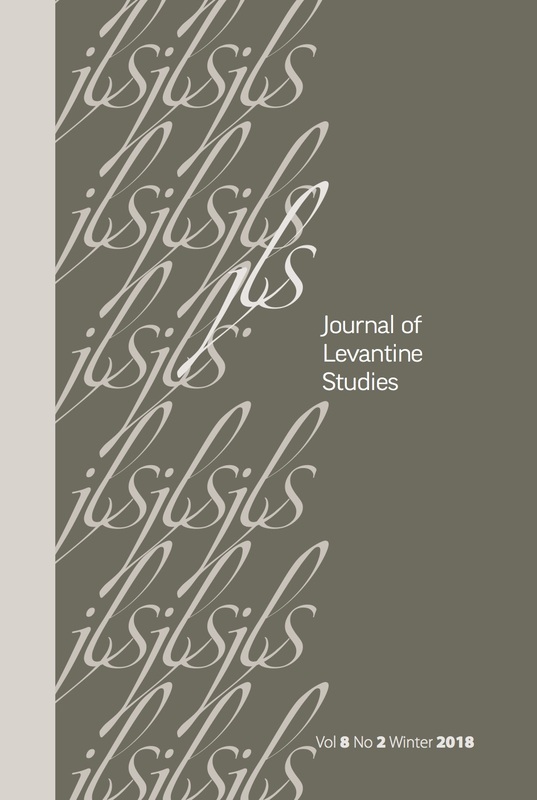 The Journal of Levantine Studies (JLS) is an interdisciplinary academic journal dedicated to the critical study of the geographical, social, and cultural settings which, in various periods of history, have been known as the “Levant.” The journal is published biannually in English in print and online by the Van Leer Jerusalem Institute.